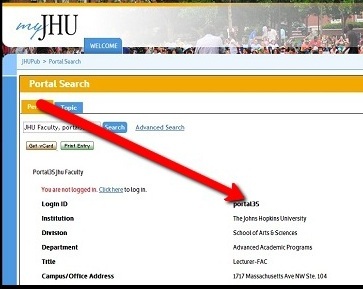 First Time JHED User Step 1: Enter your JHED Login ID OR search for yourself first by following the instructions at the bottom of the page. If you need additional help, review myJH Help for detailed instructions. If you are aware that you have multiple JHED accounts, please contact the IT Help Desk at 410-516-HELP (staffed 24hrs) to avoid complications and allow the issue to be reconciled. Please do not perform First Time Login for a new account if you already have another JHED ID. A member of the JHED Team will be in contact with you within one normal business day. If you do not know your Login ID, please search for yourself using the people search available in the upper right hand corner of this screen. Enter your Last Name in the text field that says "Last Name, First Name" and click on the Go button. A list of results will appear listing all the people with your last name. Once you find your name in the Search Results screen, click on your name to view detailed information about yourself. On your particular page, look for the field in big, bold letters titled "Login ID:". The ID appearing next to this field is your LID. If you have questions about JHED, please contact the IT@Johns Hopkins Help Desk at 410-516-HELP. Note: Helpdesk employees are not permitted to provide students, staff or faculty with their JHED ID’s. If you are unable to locate your JHED ID, you will need to contact one of the authorities listed above.